Application affecting individual landmark would include the demolition of a 1950s extension and the construction of a glass brick townhouse. On October 8, 2013, the Landmarks Preservation Commission held a hearing on a proposed project for a portion of the 1966-designated Old St. Patrick’s Convent and Girls School. The project site, located at the corner of Prince and Mott Streets in Manhattan, was originally built as an orphanage and was most recently used as school. 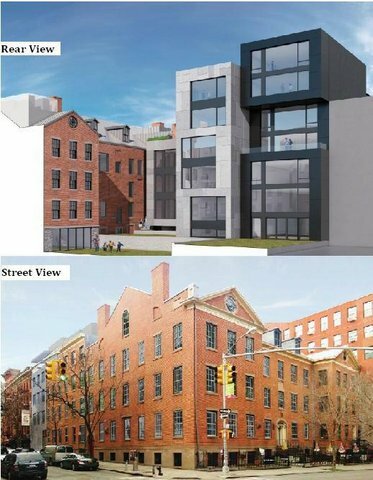 The project proposes to demolish an addition to the building from 1950 which faces Mott Street, and build a new one-family townhouse. Additional extensions would be built on the roof of an 1860 extension, also facing Mott Street. The owners would also restore the orphanage building and convert it for residential use. Monsignor Donald Sakano of Old St. Patrick’s Cathedral testified that the school, which had long occupied the building, closed three years ago. He stated that the church intended to use the proceeds from the sale of the building to maintain and restore the church’s other historic structures. Sakano said the church would retain use of three stories in the former orphanage, primarily to further its work in adult education. Abby Hamlin, President of developer Hamlin Ventures, testified that the work proposed would include the “superb” restoration of the façade of the original 1826 orphanage building, while redeveloping the interior for residential use. She stated that the work constituted a “modest expansion” of the existing square footage, which is much less than what would be allowed as-of-right under the area’s zoning. A wing of the original orphanage would also be converted to a single-family townhouse, while the rest of the property, retained by the developer, would be used as condominiums. The courtyard would be resurfaced in bluestone paving, and non-historic accretion would be removed. New construction in the courtyard would be pushed away from the rear of the original orphanage building, which Marvel said would maintain “its own distinctive presence.” No courtyard work would be visible from the street. The Historic District Council’s Nadezhda Williams found that the proposed demolitions were appropriate and the project was generally appropriately scaled, but the project was harmed by the “amount of visible bulkheads, canopies, and other additions.” Williams questioned whether a “playful” vocabulary was appropriate for a federal-style orphanage, and argued that the project could be improved by a more “coherent” design. The Society for the Architecture of the City’s Christabel Gough found many of the choices made by the architects “puzzling,” but determined that, overall, the project did not harm the landmark. An area resident spoke in opposition to the proposal, claiming it would be “disruptive” to the context of the street. The resident also noted that the site was included on the National Register of Historic Places, and fell within the Special Little Italy District. Chair Robert B. Tierney stated that Manhattan Community Board 2’s Landmarks Committee had issued a resolution to recommend approval of the proposed demolitions, but found the planned new townhouse “disharmonious” with the district. Commissioner Michael Goldblum praised the proposed restoration work as “superlative.” He also determined that townhouses were not of the type commonly found in the district, and that the color of the proposed new building was somewhat “jarring.” Commissioner Libby Ryan agreed on the demolition, and also found the design of the townhouse to be “fighting a little bit with what’s around it.” Commissioner Diana Chapin said the canopy should be removed from the new building, which was otherwise appropriate for a new building in a historic district. Commissioner Roberta Washington stated that the addition on the 1860s building should be further reduced to minimize its visibility. Commissioner Michael Devonshire recommended that, as part of the orphanage renovation, the standing seam metal roof should be replaced with slate. Chair Tierney said he found the proposal appropriate in most respects, but asked the applicants to consider commissioner comments and experiment with the design before returning to Landmarks for one more review of the project. On November 19, 2013, Landmarks voted to issue a certificate for a modified proposal. Jonathan Marvel presented the revisions. The applicants lowered and further set back the penthouse addition and reduced the visibility of rooftop mechanical equipment. On the new penthouse, the glass brick will be darkened by the introduction of different panels behind the glass. A steel channel will be added above the first floor townhouse, with other slight modification to accentuate the grid on the building’s facade. At the rear of the development, Marvel said they had taken to heart recommendations that the design be “quieted down,” by simplifying the materials and keeping different stories in one plane. Architectural historian, Elise Quasebarth stated that while the building’s structure could support a slate roof, there was no evidence that one had ever existed at the site, and she believed the orphanage had historically been topped with a metal roof. In the orphanage’s restoration, the applicants also agreed to retain blind windows on the original building facing Mott Street. Chair Tierney said that the concerns of Landmarks had been “satisfactorily addressed,” and the process of revision had been “rewarding.” Tierney led a unanimous vote for approval. LPC: Old St. Patrick’s Convent and Girls’ School, 32 Prince Street, Manhattan (14-8610) (Oct. 8, 2013) (Architect: Marvel Architects).